Qufu Confucian Temple is located in Qufu, Shandong Province. The Confucian Temple is where Confucius, a famous thinker, educator and the founder of Confucian School in ancient China, is feted. There are many preserved Confucian temples of different dynasties all over China, among which the Qufu Confucian Temple is the largest and earliest one. The Confucian Temple, Confucian Mansion and Confucian Woods are called Three Confucians, which are now one of the four extant great architectural complexes in China. Confucius (551-479BC), whose name is Qiu and courtesy name is Zhongni, lived in the Lu State of the Spring and Autumn Period (770-476). One year after his death, Lu Ai King rebuilt his three old houses into a memorial temple and offered sacrifices to him in person. From then on, the temple was constantly extended every dynasty. By the 2nd year (1018) of the Tianyou reign of the Song Dynasty (960-1279), 360 halls, porches and side-rooms had been added to the temple, making it a vast architectural complex similar to an imperial palace in style. 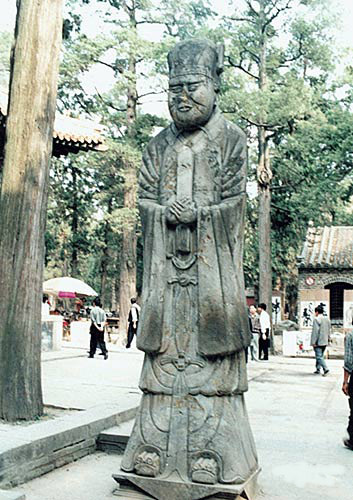 Emperors of different dynasties all held grand ceremonies to offer sacrifices to Confucius when they came to Qufu. The Confucian Temple is rectangle in shape. It is 1120 meters long from south to north and occupies an area of 327.5 mu (15 mu is equal to 1 hectare). With an axis running through it, the architectural complex of Confucian Temple is symmetrical and compact in arrangement. In the front, there are Ling Star Gate, Shengshi Gate, Hongdao Gate, Dazhong Gate, Tongwen Gate, Kuiwen Pavilion, Thirteen Imperial Stele Pavilions. From Dasheng Gate, the complex is divided into three lines: the central line includes Dacheng Gate, Apricot Altar, Dacheng Palace, Qin Palace, Shengji Palace and two side-rooms, which are used for offering sacrifices to Confucius and other Confucians; the eastern line consists of Chongsheng Gate, Poem and Etiquette Hall, Gu Well, Lu Wall, Chongsheng Memorial Temple and Family Temple, most of which are used for offering sacrifices to Confucius' last five generations of forebear; the western line consists of Qisheng Gate, Gold Silk Hall, Qisheng Palace and Qin Palace, which are used for offering sacrifices to Confucius' parents. There are 5 palaces, one memorial temple, one pavilion, one altar, two halls, seventeen stele pavilions and fifty-three lanes; 466 palaces and side-rooms in all. They were built in Jin, Yuan, Ming, Qing dynasties and the Republic of China. The most famous architectures of Confucian Temple are: Ling Star Gate, the Second Gate, Apricot Altar, Dacheng Palace, Qin Palace, Shengji Hall and Poem and Etiquette Hall. Ling Star Gate is the main gate of Confucian Temple. Ling Star is the star for talent in the heaven according to the ancient legend. The gate is named after Ling Star because it implies that the nation abounds with talented men. Therefore, when emperors offered sacrifices to the heaven, they first offered to Ling Star. They also did the same to Confucius. Ling Star Gate was built in the 19th year of Qianlong of Qing Dynasty (1754). It has iron beams, 6 stone pillars and 4 stone columns. There are 4 stone statues of heaven commanders who look awe-inspiring and haughty. At the bottom, the columns have stone drums holding them, which make the architecture solemn and elegant in style. The Second Gate is also called Shengshi Gate. With 3 gateways, it looks like a gate of a castle. On the front and back imperial roads, there are 2 Ming-Dynasty relief sculptures of 2 dragons playing with a pearl. The dragons in the sculptures overturn rivers and seas and spit clouds and fog, looking majestic in manner. Shengshi Gate was built in the Ming Dynasty. It has upturned eaves, arch vaults and green glazed tile on its top. On its front there is a white marble lane called Taihiyuanqi Lane, which praises Confucius as capable of containing everything like heaven and earth. On the eastern and western sides there is a wooden lane respectively. They are similar in style, both having decorated archways with 3 rooms, 4 columns, many arch vaults and upturned eaves on their top. On the columns are carved stone lions and heaven gods in a simple style. Kuiwen Pavilion is located in the center of the Confucian Temple. It is a pavilion for storing books. 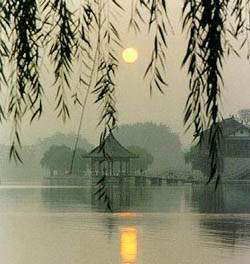 Kui Star is one of the 28 lunar mansions in ancient China and betokens article. Kuiwen Pavilion was built in the 2nd year (1018) of the Tianyou reign of the Song Dynasty and was rebuilt in the 19th year (1483) of the Chenghua reign of the Ming Dynasty. It has 3 layers of upturned eaves and 4 layers of arch vaults, 7 face rooms and 5 inside rooms. It is 30 meters long, 17.62 meters wide and 23.25 meters high. Inside the pavilions, there are 2 storeys with an interlayer between them, and its structure is peculiar and craftsmanship is intriguing. The upper floor is for storing the books and writings bestowed by emperors. In the Ming and Qing dynasties, a special official was appointed to manage these books and writings. The interlayer is for storing printing plates of books. The lower floor is for storing what were needed to offer sacrifices to Confucius, such as incense and silk. Kuiwen Apricot Altar in said to be the place where Confucius gave lectures. It is located in the center of the courtyard in front of Dacheng Palace. 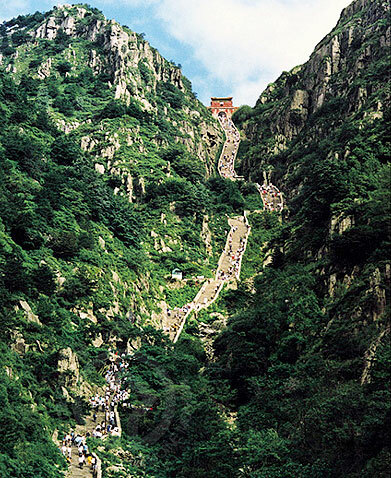 It was built in the 2nd year (1024) of the Tiansheng reign of the Song Dynasty. The altar was enclosed with apricots and thus named Apricot Altar in memory of Confucius giving lectures here. In the Jin Dynasty (1115-1234), a pavilion was added to the altar and a stone stele with the two Chinese characters that mean Apricot Altar written in seal script by a great scholar Dang Huaiying was erected in the pavilion. The altar was rebuilt in the 3rd year (1569) of the Longqing reign of the Ming Dynasty, which is today's Apricot Altar. Apricot Altar was a square pavilion with double yellow-tiled eaves double arch vaults and crisscross beams. The sunk panel was delicately carved with golden dragons. Around the altar the apricots are luxuriant and full of vitality. Dacheng Palace is the main architecture of the Confucian Temple. It is 32 meters high, 54 meters long and 34 meters deep. It has 9 layers of eaves, yellow tiles, crossed arch vault, carved columns and winding corridors. The supporting eaves have 28 columns, which are 5.98 meters in height and 0.81 meter in diameter. The back eaves have 18 columns carved with 72 dragons each. The front eaves have 10 columns, each with relief sculptures of 2 dragons flying to each other. Inside the palace are hung 10 huge inscribed boards with such words as A Teacher For Ever and 3 couplets, which are all written by Emperor Qianlong of the Qing Dynasty. In the center of the palace is the statue of Confucius, with his 72 disciples and other great Confucians on his left and right. All the grand ceremonies to fete Confucius were held in this palace. Beside the palace is a huge stone base for a Buddha, which is 2 meters high and occupies an area of 1836 square meters. In front of the palace is a spacious open stage where the Bayou Dance for offering sacrifices to Confucius was held. In addition, in the Confucian Temple there are also Qin Palace for offering sacrifices to Confucius' wife, Shengji Palace where the Shengji Painting is stored, Poem and Etiquette Hall where emperors learned poems and practiced etiquette, Gold Silk Hall where the Confucian clan have dinners, Chongsheng Hall where Confucius' last five generations of forebear are consecrated, Qisheng Palace for offering sacrifices to Confucius' father and Queli Lane which is Confucius' old house. These are all architectures with green tiles and upturned eaves. Inside the Confucian Temple there are over 2,000 steles of different dynasties. The characters on them are in various styles, among which the stele inscriptions of the six dynasties from Han to Wei are most famous home and abroad. The Confucian Mansion is located to the east of the Qufu Confucian Temple. It is the official and private residences of Confucius' descendants and therefore is also named Yansheng Duke Mansion. From the Han Dynasty (206BC-220AD), as the governments paid respect to Confucius, they took good care of Confucius' descendants and their relatives. Han Emperor Gaozu (Liu Bang) appointed Confucius' ninth-generation son as Fengsi Gentleman. Han Emperor Yuandi appointed Confucius' 13th-generation son as Guannei Marquis. In the Tang Dynasty (618-907), Confucius' 35th-generation son was appointed as Wenxuan Duke. In the 2nd year (1055) of the Zhihe reign of the Song Dynasty, Confucius' 46th-generation son was appointed as Yansheng Duke. His sequent descendants inherited the official title. Yansheng Duke enjoyed great privileges in Ming and Qing dynasties. Confucius' descendants originally lived in the old house in Queli. In the Baoyuan reign of the Song Dynasty, a new mansion was built. After Yansheng Duke was appointed, the mansion was renamed Yansheng Duke Mansion. In the 19th year (1377) of the Hongwu reign of the Ming Dynasty (1368-1644), another new mansion was built on the east of the old house. After many times of extension, it formed today's size. The Confucian Mansion occupies an area of over 200 mu, including 463 walls, buildings and so on. It has 9 courtyards, which are divided into 3 lines. The eastern line is where the Family Temple lies, including Baoben Hall, Yao Temple, New Memorial Temple, Yiguan Hall, Muen Hall, Lan Hall where imperial envoys were received, Jiuru Halland and Imperial Writing Building. On Muen Hall is hung the funeral oration that the Emperor addressed to the mother of the 73th-generation Yansheng Duke Kong Qingrong in the 5th year of Daoguang of Qing Dynasty (1825).Ã‚Â Inside the hall Kong Qingrong's mother Yu's and father Kong Xianpei's portraits and memorial tablets, their statues of sitting face to face, painting of seeking amusement are consecrated. Despite a large size, there is little colorful decoration in Confucian Mansion. However, Muen Hall is full of colorful decoration and is the only one like this in Confucian Mansion. The western line is where Yansheng Duke learned poems and practised etiquette, so it is called West School, including Hong'e Veranda, Zhongshu Hall and Anhuai Hall. There are 7 courtyards connected with winding corridors. In the courtyards there are luxuriant trees and slender bamboos, forming beautiful scenery and serene environment all through the year. The central line is the main body of the Confucian Mansion, which is arranged just like the past. The front part is government offices, which are divided into 3 courts and 6 halls, governing 4 offices and taking charge of etiquette rites. The main court and the second court are where Yansheng Duke received government officials and dealt with government affairs. In the center of the main court are exhibited government stamps, the four treasures of the study, flags and arrows used as tokens of authority, etc. On the two sides are guard of honor used for Yansheng Duke when he went out and tablets for official titles. There are over 100 pieces in total here. The 6 halls are on the two sides of the main court. On the eastern side, there are Stamp Hall for keeping stamps of Confucian Mansion, Book Hall for storing books, writings bestowed by emperors, and Management Hall that arrange silver and grain renting and sacrifices offering. On the western side, there are Transaction Hall where official documents were dealt with, Music Hall, which manages music and dance used for offering sacrifices, and Labor force Hall, which is in charge of the labor forces of Confucian Mansion. The back part is private residences, including Front House, Front Building, Back Building, Back Five Rooms and so on. The buildings of the private residences have upturned eaves, ridges, carved columns and colorful rails. The Front House is where Yansheng Duke' family received their relatives and held grand feasts, weddings and funerals. In the house are exhibited tableware of the Confucian Mansion and other things bestowed by Emperor Qianlong. In the four corners of the yard, there are four stone drums used for drama performances. The Back Building is where Yansheng Duke' elder generations lived. In 1937, the 77th- generation Yansheng Duke Kong Decheng held his wedding ceremony here. In the dinning room are exhibited the presents given by Kuomintang officials. In the two East Rooms there are a lot of precious furniture, pearls, gold wares, silk and paintings. On the wall hang the peony drawings by Mei Lanfang, Kong Decheng's wedding photo and family photo. At the end of the private residences is the garden, which was built in the Ming Dynasty (1368-1644) and rebuilt in the Jiaqing reign of the Qing Dynasty (1644-1911). It is also called Iron Hill Garden because of an iron hill in the garden. In the garden there are flowers, vines, pools, hills that are of peculiar design and elegant taste. There are also 5 Gentleman Cypresses, each with 5 branches. The 5 cypresses encircle a Japanese pagoda tree. This is a wonder of over 400 years. The Confucian Mansion treasures up many books and documents from the 13th year (1534) of the Jiaqing reign of the Qing Dynasty to 1948. From 1949 to today, over 9000 volumes (over 300,000 pieces) have been arranged. These files reflect the political, economic and cultural condition of Ming, Qing dynasties and the Republic of China from different angles. Therefore, they are important materials for the research into China's feudal system in the later period. Moreover, in the Confucian Mansion there are over 10,000 jewelries and clothes bestowed by emperors of Yuan, Ming and Qing dynasties. Among them one crown of the Yuan Dynasty is especially precious because it is the only one in China today.